This plastic bush mould tooling was made from hardened steel types P20 plates (1.27), and Gauge Plate (1.28) H13 inserts and capable at least 1 million + mouldings. 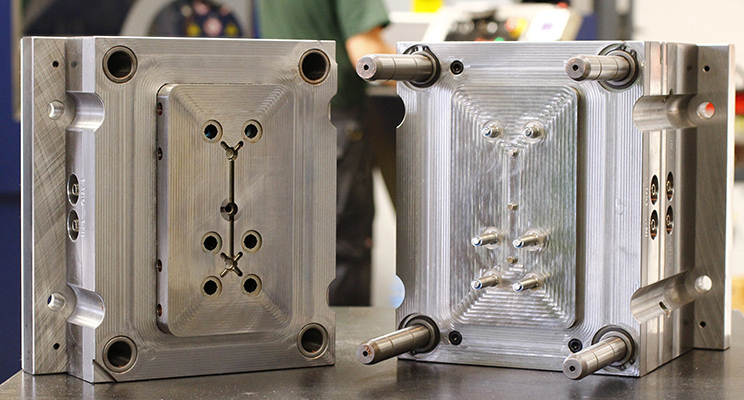 The tooling was created using a 3 axis Mazak for the inserts and dies and blocks, a 5 axis Hurco for the bolster, an Ops Ingersoll High Speed Eagle V created the electrodes to a 10 micron tolerance, and a Ingersoll Gantry Eagle 400 EDM spark erosion machine. All stages of the process was measured to 10 microns. The tooling was completed in 10 weeks.